Nowadays, file converter tools are really important. We need this kind of tool daily to convert files from one format to another format. So, if we know online file conversion tools, we can help our self in better way. If we rely on windows tool, we cannot carry these tools all the time. So, online file conversion tools really makes sense. 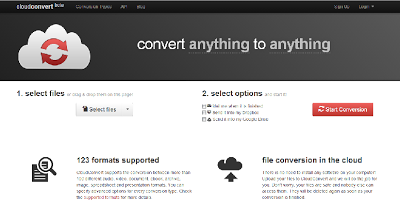 In this post, we will see a nice online file conversion tool called Cloudconvert. Cloudconvert is really a nice online tool that allows users to convert files into different file formats. It converts files of any type- documents, ebooks, images, audio, videos, spreadsheets and presentations. The tool is also mobile friendly so, you can use it easily with your smartphone and tablet. To Convert files, you only need to drag and drop file on the page. You can also select files from your Dropbox or Google Drive. After uploading file for conversion, select the format in which you want to convert the file. File conversion takes time, so you can select any of three option to get the converted file. You can select email, send to Google Drive or send to Dropbox option. After selecting all the options, you can click on big Start Conversion button. More than 123 supported formats. No registration needed to convert file. I personally use this tool and happy with the service it offers. It supports wide range of file formats that makes it worh to use. The tool is online so, we can se it from any where. With CloudConvert, you have your file conversion tool all time with you.